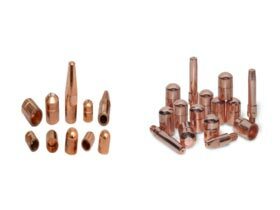 Our valuable customers can acquire from us best quality Spot Welding Electrode Caps which are highly demand in the market. We as a prominent Supplier, Exporter and Importer, put a great effort in delivering excellence. Spot Welding Electrode Caps comply with standards like ISO 582. They can also be customized as per customer's specifications. In addition, these Spot Welding Electrode Caps Cabinets can be availed from us at the market leading price.